While this isn't a sketch per se, it is part of my routine. 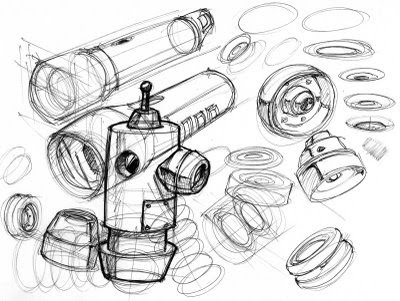 You see, whenever I want to sit down and actually put pen to paper, I have to warm up first, so I lay down some common forms (cubes, ellipses, cylinders, etc.) to get my brain and muscles in sync. I have been interested in improving my ellipses so this page is a warm up for that part of my brain. I know it looks a little scatterbrained, but its just to get the juices flowing.